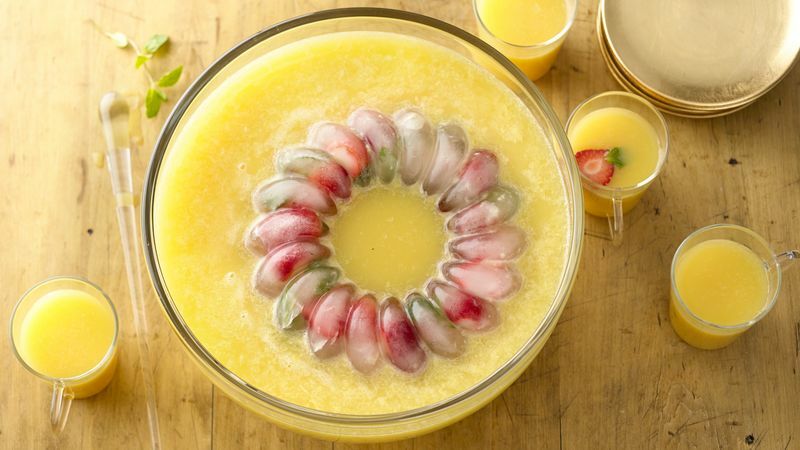 Make an easy ice ring using a ring mold or bundt cake pan that fits inside your punch bowl. Arrange sliced fruit or berries and mint leaves in the mold. Add water to fill three-fourths full; freeze until solid, then unmold. Using fruit-flavored sparkling water brings another level of flavor to this sensational sparkling punch. For fruity ice cubes, drop small strawberry slices and mint leaves into a filled ice-cube tray before the water is frozen. Add fruity cubes to the pitcher or punch bowl just before serving. Chill the pitcher or punch bowl, and fill with citrus punch just as your guests arrive.